Tag Archives for " Hampton "
US301-Legalized Highway robbery with two towns singled out by AAA as “Traffic Traps”. Highway 301 runs through Florida just South East of Jacksonville. From Baldwin to Hawthorne, it is notorious for it’s issuing of speeding tickets. 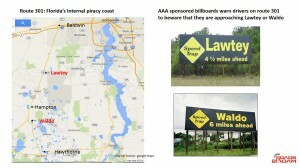 Two towns in particular – Lawtey and Waldo – are infamous for their overzealous ticketing, so much so that AAA officially declared them “Traffic Traps” : The only two cities in the United States to have such a declaration. “Traffic Trap” – AAA condemns traffic enforcement measures and practices which are designed to raise revenue rather than prevent crashes or where there is evidence that enforcement is not justified by sound engineering principles. AAA particularly condemns the use of traffic traps which involve unfair, unethical or illegal law enforcement tactics or traffic control devices, as well as the use of speed measurement devices on roads with speed limits appreciably less than warranted by sound engineering principles. 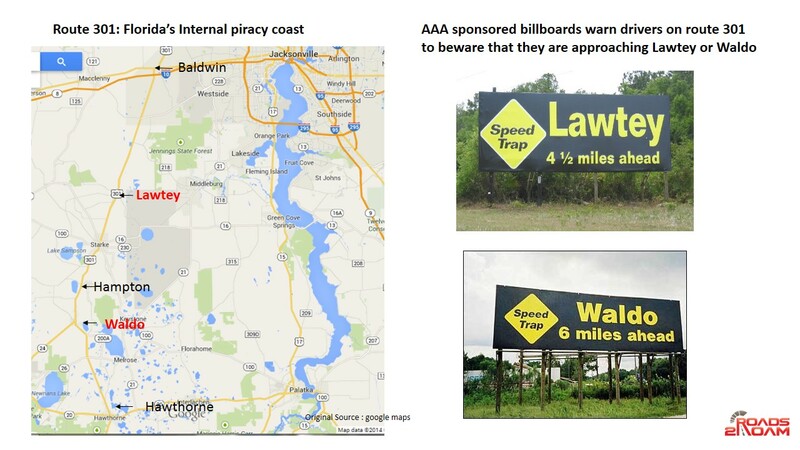 AAA is so outraged, it even paid for billboards to warn motorists traveling down 301 to beware that they are approaching these towns. Continue reading..